Skylock hopes to woo tech-savvy bicyclists with a solar-powered lock that syncs with your smartphone and the cloud — but it's not as crazy as it sounds. Well, maybe it is, but it's also really cool. Basically what you've got is the U-lock familiar to most cyclists, except instead of an ordinary key mechanism there are integrated electronics that let you either unlock it with your smartphone or tap in a numerical password. But the obvious question is: If it ain't broke, why fix it? Because of all the fun toys you can add, obviously. And some might even make you and your bike a bit safer. For one thing, you can't lose the key, and the lock can't be picked. After the Kryptonite/Bic disaster of 2005 (a $1 pen could open a $80 lock) everyone's worried about that. Not only is there no keyhole, but if someone jostles your parked bike longer or harder than what's expected on the street, the built-in accelerometers detect it and send your phone an alert. Those same sensors can also determine when you come to a sudden stop while riding. It compares that data to motion detected by your phone, and if it determines that you and your phone went a few feet farther than the lock and came to another sudden stop, it asks whether you're OK. No answer? Emergency responders are alerted. As long as the lock has Wi-Fi, it's also connected to an account you set up whereby you can unlock it from afar — or give others the ability to unlock it. That way you can share the bike with your friend or rent it out using a ride-share service. And what about power? Gerardo Barroeta, Skylock's CTO, is confident there won't be a problem. "I've devoted about 10 years of my career to developing low-power systems," he said in a phone interview. "We had to make this from scratch and really engineer it to have basically no friction. One full hour of sunlight puts enough juice to run the device for a week." Interested? $159 will get you in the door if you preorder, but the price will only go up from there. 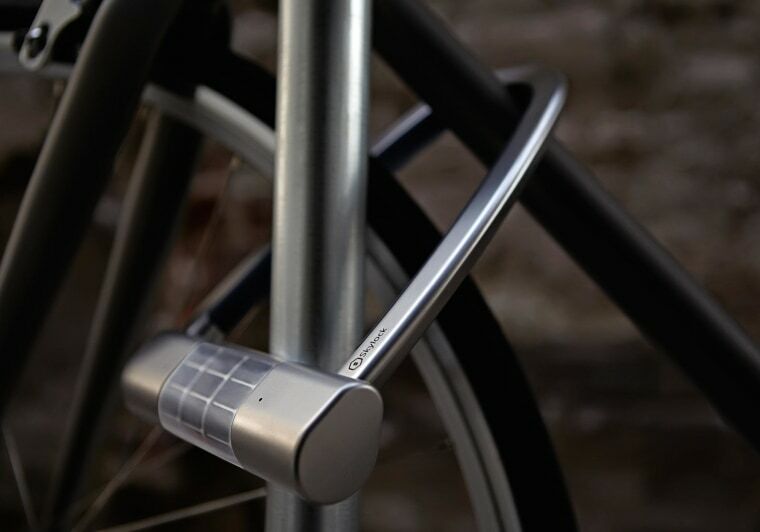 And the world's smartest bike lock is a perfect complement to the world's smartest bike.